These are dark times for European rail travel. While the annual timetable change on the 9th of December was a memorable day for high speed rail, a large number of long distance trains were shortened, confined to one or two days a week, or axed altogether. No more Amsterdam-Beijing with only one change of trains in Moscow, for example. I can image that, for a lot of national railway companies, night trains are something of a puzzle. Until recently, France had an extensive network of night trains, bringing you from Paris to every corner of the country with their Lunéa trains. And while they still exist today as ‘Intercités de nuit’, their number has been decreasing each year. Advertising by the national rail operator SNCF ranges from poor to non-existent, as high speed daytime services on the same routes give them easy money and more passenger turnover. Why cater to the slow traveller anyway? For this reason, among all these cutbacks, it was quite interesting to see SNCF launch a long-distance bus service, iDBUS, which does exactly that: it creates a slow alternative. And, of all routes, they chose Paris-London, and Paris-Brussels. Two routes where Eurostar and Thalys trains bring you from A to B in under two hours. So why would people take a bus that travels 9 hours from London to Paris? Well..yes, but not in a spectacular way. At least not if you book two months in advance. I use Eurostar frequently, and if you book a few months in advance, the price difference between iDBUS and Eurostar is not that large. If you want to travel to London tomorrow, however, it becomes interesting. A Eurostar ticket for today or tomorrow costs at least €120, an iDBUS ticket will set you back about €55 for the London-Paris trip. Even 1 hour before departure. But if you book two months in advance, is it really worth travelling the slow way..on a bus? Coach stations are quite special. Wherever you go in the world, there is nothing more interesting than a place where people are waiting for a bus. I travelled through quite a few bus station in China, and they were all indistinguishable from each other: Victoria station could easily have been one of them. It is not the most attractive spot in London, and it looks like something from a by-gone age, but it communicates exactly the kind of atmosphere you associate with coach travel. My coach is not due until 23:30, but I spend my time observing. The next bus at the gate is the 22:30 to Aberdeen. It takes nearly 12 hours to go all the way to Scotland, 7 more than the fastest train, but tonight it is full. Mainly elderly people and students, it seems. The man sitting next to me, a 85-year old northerner from Carlisle, opens a tin of biscuits and tries to seduce the two 70-somethings across the aisle, but they fend off his advances by claiming that Scottish shortbread does not agree well with their false teeth. As the departure bell sounds, both pepperpots and Don Juan de Carlisle stumble off towards the coach outside. At 23:00, the iDBUS staff arrives, and does a quick passport and ticket check. Perfectly bilingual. Very polite. A few moments later, all passengers (there are only 7) are led towards the coach, where the driver scans my ticket and shows me where to leave my luggage. One thing that is immediately apparent when you board the coach is the smell. Everything smells new and leathery. Like an expensive taxi service. I suspect it is part of their client-binding strategy, and a way to distinguish themselves from the 48 hour Eurolines bus to Kiev, but it does work. It creates a sense of security and trust. The seats are excellent and very large. There’s a 220V plug on every seat. And on-board Wi-Fi. Included in the price. After a short introduction of the on-board facilities by one of the two drivers and a brief ‘sleep tight’, the bus sets off across midnight London. One of the nice things about night travel, either by train or by bus, is the way you travel through suburbs, cities and countryside as a silent observer. The first hour or so, the coach travels through London, past Battersea, Vauxhall and the southern suburbs towards the M20 to Kent. You can see the city slowly falling asleep, as people leave pubs, walk drunk along (or on) the road, and go home. The best way to see a city alive, is by travelling through it. Here, I should point out the difference between the day services and the overnight service. 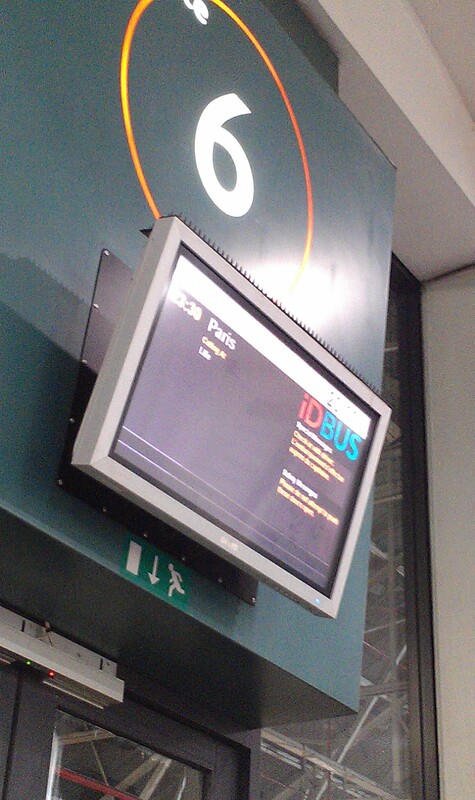 iDBUS uses the Chunnel to cross the Channel to France, so the time spent waiting at the Channel Terminal depends on the availability and timing of shuttle trains. During the day, this takes only half an hour or so. At night, there’s a 90 minute pause on the parking lot, because there’s one train every 2 hours. But this isn’t really important, as you’re asleep anyway. In very much the same way as night trains sometimes spend a few hours at a station to change locomotives (or simply to stretch time to make you arrive at your destination at daybreak). The bus drives through Customs (from what i’ve heard, passport checks occur on board on some coaches) and into the awaiting Shuttle train. What follows is all very futuristic. Train closes, spaceship health and safety announcements are made, and 30 minutes later (or 90 minutes, if you count the time zone) the carriage opens up again and you drive off on the wrong side of the road. You can leave the bus during the crossing to stretch your legs, but really, the shuttle train isn’t that interesting. It’s really just a hollow tube on wheels. 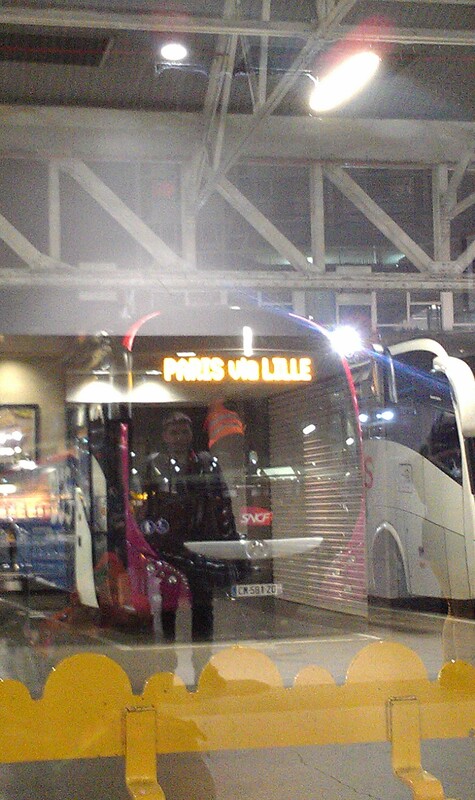 14 minutes later than the scheduled arrival time, the iDBUS pulls into Lille, and stops on the upper part of Lille Europe. The driver makes it a ‘point d’honneur’ of saying goodbye personally to everyone leaving the coach here. In fact, he’s leaving the coach as well, as another chauffeur team boards for the remaining leg to Paris. Nevertheless, it’s a service you don’t get on a TGV. There is none, really. Though, if you’re not used to travelling by night in a bus, then it might be a bit tiresome. I admit I didn’t sleep a lot, but that had more to do with the excitement of discovery than my discomfort. As there were only 7 persons on the bus, I could spread my little travel ecosystem over the seat next to me. I can imagine that a full bus is something quite different. Then again, there’s more comfort and leg room than in a 1st Class seat of a TGV. Excellent slow alternative to the Eurostar. Almost spot on time. Well-trained staff. Leg room. This entry was posted in Uncategorized and tagged England, france, iDBUS, review, trains, travel. Bookmark the permalink. I rode these buses several times two years ago for trips between Paris and Brussels. Their main advantages are that they remain affordable until the last minute and give you enough leg room. in addition, they have inherited from their SNCF parentage a tradition of high professionalism. Their sole true disadvantage is that they are much slower than the high-speed train. Otherwise, they are A-OK.